The surpise winner of the Tal Memorial, Boris Gelfand, provides detailed notes on his decisive game against Nakamura. Fabiano Caruana comment on his victory over world-champion Anand in Moscow. For the first time US-champion Gata Kamsky analyses for ChessBase Magazine. He annotates his victory over Dominguez-Perez, the winner of the FIDE Grand Prix in Thessaloniki. Zoltan Almasi played a strategical master game in the Sicilian Rossolimo (3.Bb5) against the new European champion Moiseenko, the Hungarian GM offers in-depth analysis on the DVD. NEW! Daniel Kings presents his column „Move by Move“ in the new interactive video format with training questions and detailed feedback even when you fail to find the best move. 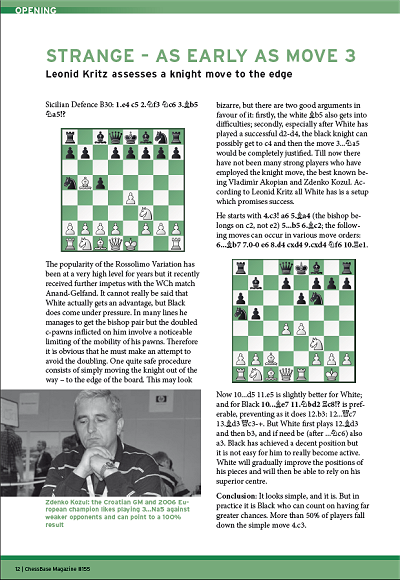 In this issue your task is to win against the King's Indian (Eljanov-Baryshpolets, Kiew 2013). Opening video: Opening expert Mihail Marin reveals secrets of the Queen's Gambit in a 30 minutes lecture. Leonid Kritz: "Strange - as early as move 3"
Five top-class tournaments: Carlsen was among the starters twice (Wijk and Baden-Baden) and was victorious on both occasions. The same goes for Nakamura but in Gibraltar and in Zürich. The FIDE Grand Prix (Tiflis) saw an impressive victory by Tomashevsky. Highlights: Grand Prix Tournaments Baku and Tashkent, Grand Slam Final and European Cup in Bilbao. Analysis by Anand, Adams, Andreikin amongst others. Interactive training on tactics, strategy and endgames. 13 openig articles from Reti to King'sindian! Enjoy the high points of Norway Chess 2015 and FIDE GP Khanty-Mansyisk with high-class annotations and “Round-up-shows” with Daniel King (video). 14 opening articles with lots of new ideas. Training sessions from the opening trap to pawn endings!